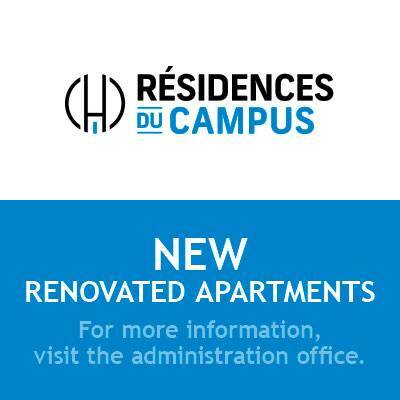 ocated directly on the campus of the Université du Québec à Trois-Rivières, the Résidences du Campus provides students with an all inclusive residence-living experience near all amenities. Specially designed for students, this 11-building complex offers 310 bedrooms, within spacious 6 1/2 furnished apartments, with heating and hot water included. Surrounded by nature, this historic town is still developing through its education and tourism sectors. Many cultural activities and events take place in the nearby downtown area, easily accessible from the Résidences du Campus.